Bhutan is the small kingdom on the south slope of Himalayas. By recent years the Kingdom was closed to other countries, there are still unique culture. It is not difficult to travel to Bhutan. From year 1974, tourist can get into the Kingdom, now you can flight easily to Bhutan by a jet air plane. While your trip to Bhutan, you may see the himalayas peaks nearby and unique alpine plants and animals. You will feel flowing times gently. Above all you touch the culture which Bhutanese people bring up. Well, there are special regulations for trip to Bhutan different from other nations. Please be sure the points of Bhutan trip. You cannot get into the Kingdom without contract of tour company. Tour expence is fixed rate by government, which is so expensive as US$200. A number of tourist is limited around a few thousands in a year, but you may not worry about this limitation. Most of tourist is Japanese but tour guide mostly speaks English only. So you can enjoy with Bhutanese tour guide. You can contact travel agent in Bhutan. For your information, you can refer a table of Bhutanese travel agent in the last part of this page. Top tour season is Tsechhu festival in Spring and Autumn. For your reference in 1999, Tsecchu festival was held from March 27th to 31st at Paro and from September 17th to 22nd at capital Thimphu. The other locations festivals are held. ：Trekking available but mostly raining. Routes to Bhutan are two. one is the air route by the Druk Air (Royal Bhutan Airlines), the other is the land route through the Indian border. Anyway you must make contract with a tour company. Druk Air is the national flagship airline. From Japan the best gateway airport are Bangkok, Thai or Kathmandu, Nepal. Their own jet engine airplane equipped 72 seats fly to Paro international airport. From Paro to capital Thimphu the distance is 65Km, 2hours by hired car. You can enter the Kingdom at Phuentsholing town the Indian border. You need Indian visa because you go into Indian teritory. From Phuentsholing to capital Thimphu the distance is 176Km, about 6hours by hired car. At good season, you can enjoy the great himalayas summits from the windows of Druk Air far away. I recommends left hand side to see the giants. The procedure entering Kingdom of Bhutan. Please contact travel agency in your country or land operator in Bhutan directly. Through the contract you get the visa clealance number by the Ministry of Foreign Affairs Bhutan. 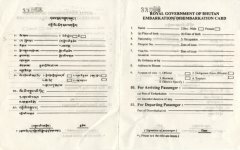 Visa clealance number is required at the time purchasing of Druk Air ticket. By air route entering, you get a Druk Air's ticket through your agency. At the time of entry into the Kingdom, by showing the visa approve papers, you get visa at your passport actually. A fee of visa for staying within 15 days is US$20. You can extend the visa with fee 510 Nu. at Thimphu office within 6 month. Returnning ticket of Druk Air is get at the counter of Druk Air main office Thimphu. Only US$ cash is accepted. At Paro international airport you pay 300Nu. in cash only. While a festival is held, many tourist vists Bhutan. Especially the biggest festival is Paro Tshechu festival in Spring. Based on the Bhuddhism story, you will see mask dances. Many Bhutanese families come to see the festival. The last day of Paro Tshechu you will see a huge Thangka picture for the climax. Bhutan Tourism Corporation Limited (BTCL) --- +975-2-23292 There is no mailaddress but a homepage.